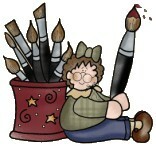 Laurie is a designer and teacher of decorative painting and art. She has designed over 50 books, hundreds of patterns packets and stencils. Many of her products have been available in the retail stores and online. She has a strong educational background and enjoys the teaching process. Laurie believes that there is a place for everyone in painting. Her greatest pleasure is making people smile while they learn to “step out of their box” and try things that are new to them. Creativity is a process and there are endless possibilities and solutions to any problem. Enjoying the process and the challenges is what makes it so much worthwhile. Laurie has been in the business over 20 years and looks forward to new challenges and adventures.